Thor: Ragnarok stands as the 16th installment in the sprawling Marvel Cinematic Universe (MCU) – an impressive feat when you consider the immense scope contained within each of these serial epics. When viewed as a whole, the MCU is a cinematic achievement unlike anything we’ve ever seen on the big screen. But even taken as individual adventures, Marvel’s cinematic output contains some of the most inventive action-adventure cinema being produced today. Thor: Ragnarok certainly continues that tradition, upping the ante once again both in terms of story and cutting-edge visuals. Impressively, almost every single shot in the movie contains some form of visual effects – and that amounted to almost 2,700 individual shots. That meant a great deal of feedback, editing and collaboration…all of which was handled with cineSync. “The Marvel films are big beasts – and they keep getting bigger,” begins Marvel VFX supervisor Jake Morrison. “Our main driving goal on each project is to make sure we never, ever repeat ourselves. The worst thing our audiences could think would be, ‘Oh, it’s just another big-budget superhero film.’ We want to always move things forward and take our audiences on a journey along with the characters. Thor: Ragnarok is nothing short of a cosmic road trip. Thor and lab partner/indestructible killing machine The Hulk find themselves trapped in a deadly gladiatorial contest, while also fighting to keep the villainous and omnipotent Hela from destroying the hammer-wielding god’s homeworld of Asgard. Taika Waititi is at the director’s helm – a newcomer to the MCU who finds inventive ways to inject colour and comedy into the film’s galactic set pieces. 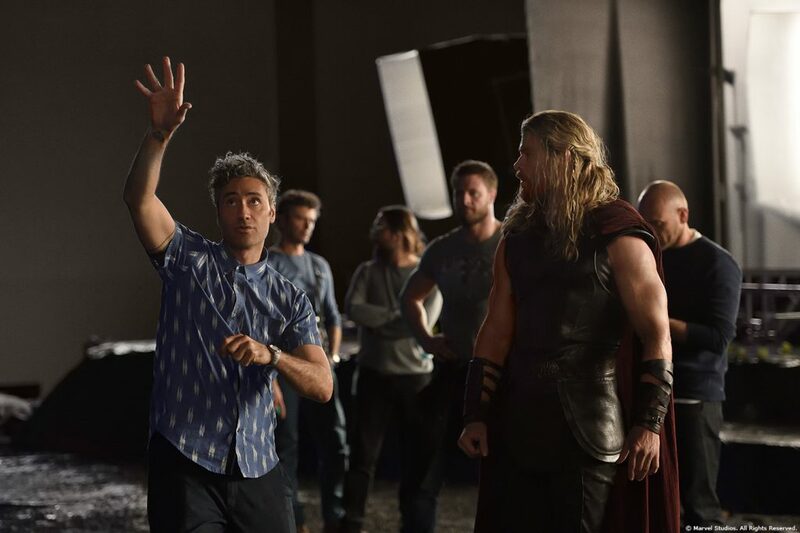 He was joined by Morrison in the visual effects department who – unlike Waititi – is a true Marvel veteran, having forged VFX for the likes of Ant-Man, The Avengers, Thor, and its sequel The Dark World. His experience goes beyond the panels of the Marvel universe too, with work delivered on many highlights of cinema’s VFX pantheon, including The Matrix and Lord of the Rings. Four key vendors worked on Thor: Ragnarok – Industrial Light and Magic, Method Studios, Rising Sun Pictures, and Framestore – alongside a large number of other studios that joined later in post-production, 18 in total. cineSync was the bridge that connected each of these disparate houses, located all over the world, to Morrison back in LA. “Working on a show like Thor: Ragnarok is like plate spinning – but you have many, many plates going at the same time,” says Morrison. “Different approaches to the same shot might bring out comedy, or drama, or excitement. I spend most of my time talking with people on the other side of the world; checking in and reviewing their dailies to dial in that tone and get it feeling just right. cineSync sits at the core of that process, making sure feedback is communicated effectively and instantly. Out of Thor: Ragnarok’s 2,700 shots, some of the most creatively intensive were the environmental builds that help to set the scene. Thor: Ragnarok is replete with some of Marvel’s most beautiful world building, from Asgard itself to new locations like Sakaar. cineSync’s drawing tools were integral in nailing down details in these digital sets, enabling Morrison and Waititi to instantly establish understanding and create with a shared mindset. “We’re in a visual business, and we really pushed outside of the box on Thor: Ragnarok’s visuals,” says Morrison. “What’s great about working with Taika is that he’s an artist in his own right – I can hand him a tablet and pen and he’ll happily sketch out whatever is in the dark recesses of his mind. “As such, using cineSync came naturally to him,” he continues. “Taika gets really stuck into sessions, sketching in the approach angle of a spaceship, or the direction of Thor’s hammer in flight, or detailing the outline of a cityscape. Or, sometimes he would just doodle for fun. cineSync is always in active development – it’s a living tool, constantly refreshed and updated as needs arise. And Thor: Ragnarok was one project that pushed the solution into new areas. Changes ranged from the intricate to the simple, such as adding new hotkeys to quickly shuffle between frames. One of Marvel’s more bespoke customizations became affectionately known as the “Kitten of Calm”. “We really wanted to make sure fans would be happy with this movie, and at times the team could get a little tense,” explains Morrison. The request came in for something to mitigate this tension – and the cineSync development team complied. At a moment’s notice, Morrison could hit a hotkey and a cute, white kitten would appear on the review screen, accompanied by soothing music. In cineSync, Morrison has found the perfect tool to meet both his own and his vendor’s needs, whether that’s in soothing people with cute kittens or enabling fast, seamless feedback at a moment’s notice. “The fact that cineSync works instantly means we can be spontaneous, weirder and faster!” says Morrison. After 16 movies, each more visually stimulating than the last, creating something that an audience hasn’t experienced before is no small task. Thor: Ragnarok had some pretty big boots to fill in that regard – and fill them it does. “At this point, we’re able to make a pretty cool Asgard,” says Morrison. “We’ve built the place three times by now after all, so we should be getting better at it, that’s for sure! Also, we think we have the best Hulk that’s ever been seen in an MCU film – and he’s been in five previous pictures.